Last week I was walking through a craft store when I came upon a bin of cardboard/papier-mâché animals. There were several animals but I was instantly drawn to this little pig. He was only $.99 so I had to have him. and my ceramic paper plane also from Target. While I obviously love ceramic objects, it gets expensive buying them. 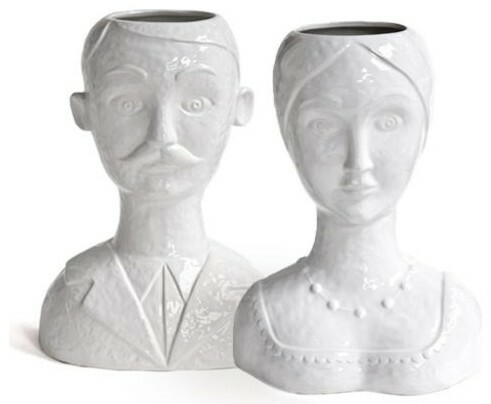 For example, I am obsessed with these Jonathan Adler head planters but they are $300 so that’s not going to happen. 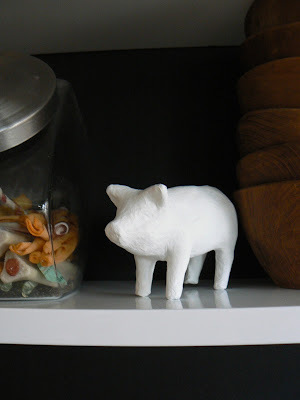 That is why when I spotted this little pig I knew he would make a good faux ceramic animal to add to my ever growing collection. Here he is all painted. I just used white paint I had on hand. No priming or sealing, just straight up white acrylic paint and truth be told, I didn’t even do a second coat. Next time I buy semi-gloss white spray paint he’ll probably get a coat of that, but right now I used what I had and I think he looks great. The best thing about this project is that it only cost me $1.06 with tax! That is a very cheap ceramic animal since they tend to be about $15-30 each. I had paint on hand so if you don’t have paint you’ll have to buy that but otherwise it is a super cheap project. 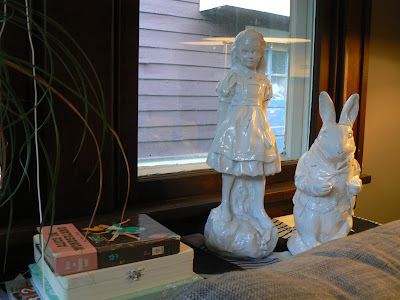 You can get this look with lots of other objects like kids plastic animals, garden statues, thrift shop glass vases, or plastic fruit. So are you in the buy-it or the DIY-it camp? So far I have a mixture of both, which works perfectly for me. It looks awesome in your kitchen against the black wall! Thanks! They are a really great backdrop for all sorts of objects. 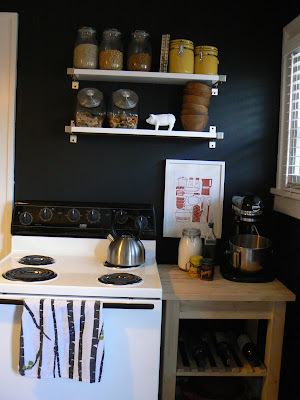 I love the way you styled the shelves. Functional and pretty! Cute pig! What’s in the glass jars? Thanks! The top jars are dry food like pasta, rice, and popcorn. The two next to the pig are dog treats 🙂 I guess that’s sort of gross to have in my kitchen but it works for me.